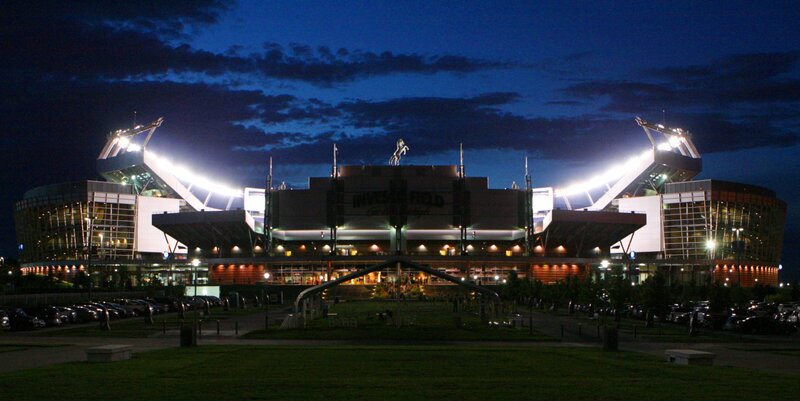 DENVER, CO – A torrential downpour of rain on Wednesday night didn’t stop winners of the 10th Annual Colfax Marathon from making the journey to DeVita’s world headquarters in Denver, Colorado for the marathon’s award celebration. Ascend Performing Arts was one of those winners in attendance. 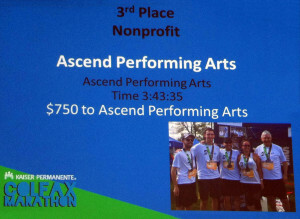 Ascend won a $750 check and bragging rights at the Colfax Marathon. 60 winning relay teams were recognized at the event in a crowd that included Olympians Constantina Diţă, and Nuța Olaru, as well as Denver mayor Micheal Hancock who opened up the awards ceremony. Hancock commented on the race, lauding it’s uniqueness as one of only three marathons in the country that incorporates charities. Later, a representative of the Denver Zoo chimed in on the race as well, noting that it is one of two races in the country that goes through a zoo. 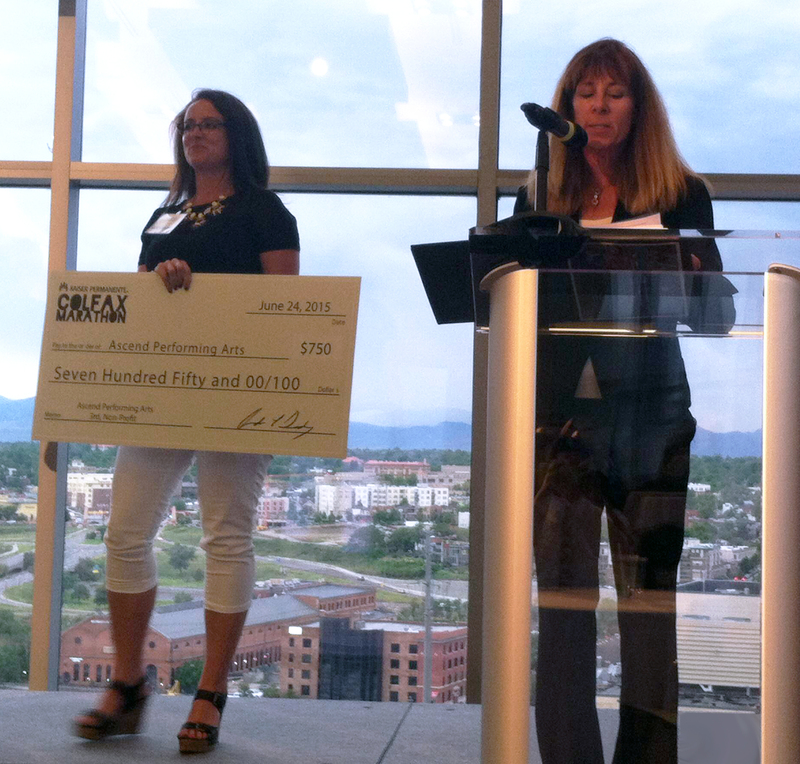 When the ceremony began, it was all smiles as teams went to accept the awards with Colfax Marathon CEO Andrea Dowdy commenting on each group as they crossed the stage to accept an oversized check as well as a trophy. Jordan Jacobsen accepts the third place award while Colfax Marathon CEO Andrea Dowdy comments on Ascend’s mission and programs. As Ascend Performing Arts took the stage, Dowdy told the audience about Ascend as Jordan Jacobsen, Communications & Development Assistant, accepted the award and a check for $750. Jordan ran with Ascend’s Non-Profit team along with director Mark Arnold, Rod Kosterman, GM Kuzma and Cody Arnold. The team placed 3rd in the nonprofit division. Ascend also sponsored an Open Division relay team that included members of the drum and bugle corps. Ascend’s first year in the Colfax Marathon ultimately turned out to be a success, and provided members and staff the opportunity to elevate their life performance both on and off the field. Read more about the marathon weekend and watch this video recap below for more insight into Ascend’s wild weekend. Stephen Bates’ involvement with Ascend Performing Arts includes membership in the Blue Knights Percussion Ensemble in 2014 and 2015. 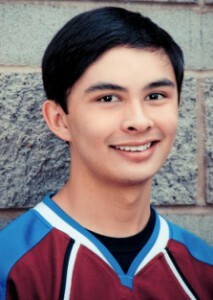 He is pursuing a Communications degree in Digital Film-making at the University of Colorado at Colorado Springs, where he also works as a graphic designer/marketing coordinator for the office of Student Life and Leadership. Stephen co-founded Tomahawk Percussion in 2014 with fellow Blue Knights Percussion Ensemble member, Tom Griess. Tomahawk Percussion was founded to provide resources, support, and a community for those involved in the marching arts. Outside of school and music, Stephen was TIME Magazine’s Person of the Year in 2006, is a shareholder/part owner for of the Green Bay Packers, and has had his name engraved into NASA hardware that has flown into space.